This Mondrian is in a private collection, thus it is very unlikely that Hill saw it while he formulated his idea of visual art. I have included it to provide evidence for an aesthetic order many artists in Europe, two decades before New York became interested in it. Some intoxicated with geometric abstraction during the 1960s, others preferring abstract expressionism. Readers of Chipps will be aware of the two poles of abstraction, the geometric spoken for by Mondrian, and biomorphic spoken for by Kandinsky. Later, during the 1960s a strong group of painters and sculptors became known as minimalists, several of them protesting the inappropriateness of the label. The abstraction, De Stijl, constructivism and Minimalism, all insisted that their aesthetic canon had a moral dimension. Made famous by an architect Buckminster Fuller during the 1920s the thought that “doing more with less” is morally superior intertwined soon with the influence of Japanese aesthetics focused on the freedom and essence of being. No wonder that this mix of traditions still attracts. 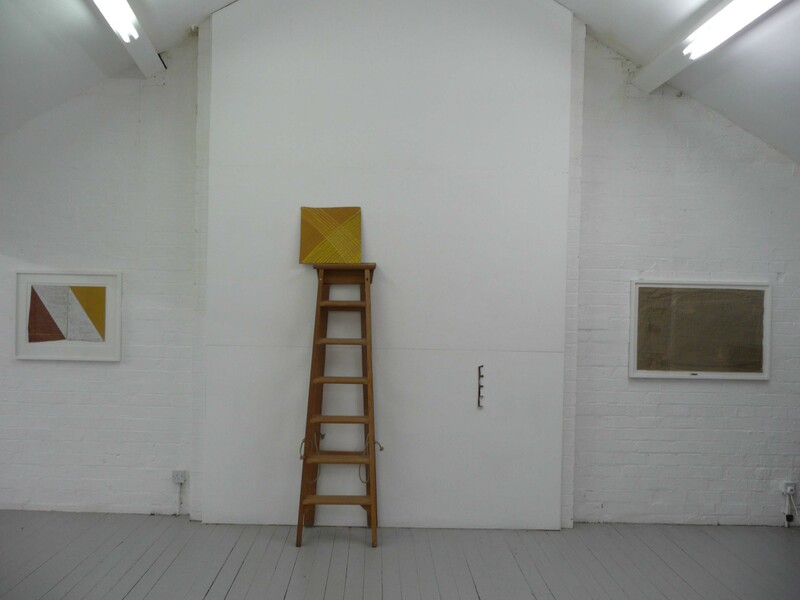 In his current exhibition Tony Hill presents drawings, photography, installation and constructed objects. 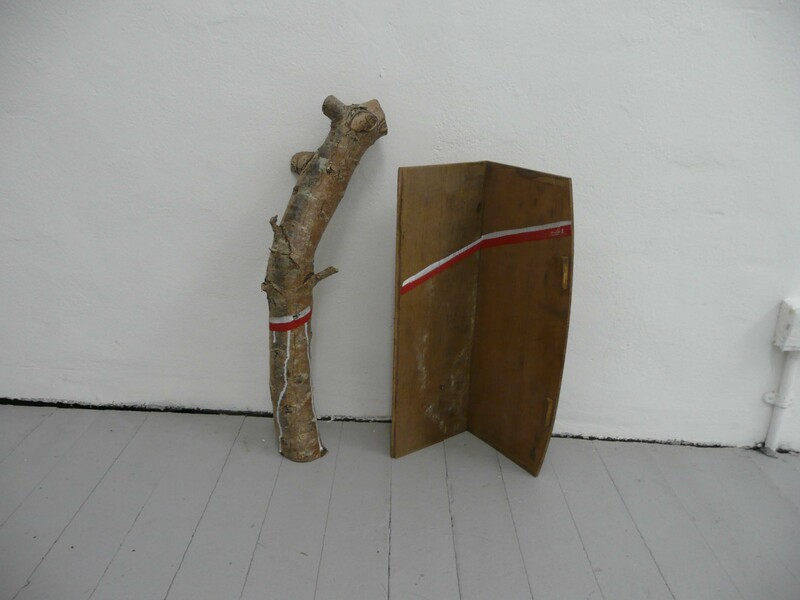 There are two installations: one, a small duo of a part of a hawthorn branch with a part of an old drawer. A red and white painted ribbon on both. The two objects are in a conversation that paused for a thought. Angular and round forms mirror the difference between the man made and natural, rational and intuitive. 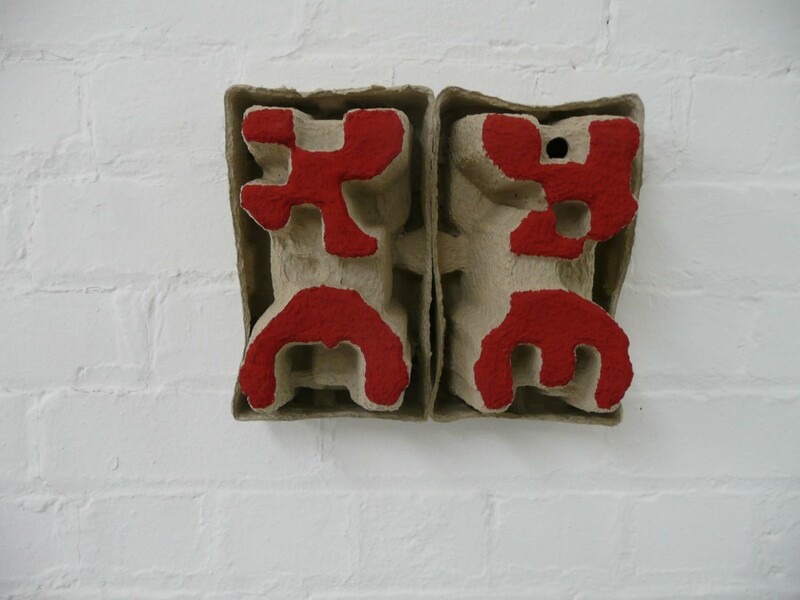 No such dualities appear in the second installation. 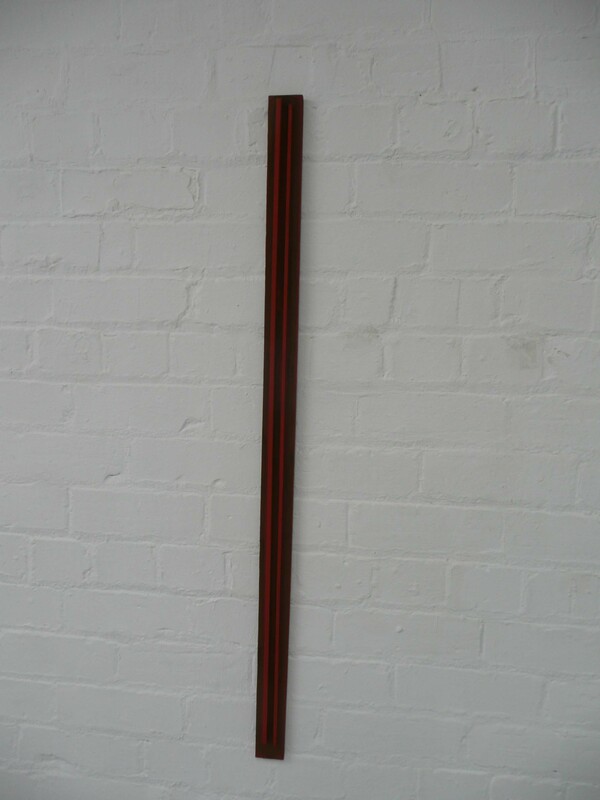 The ladder is in its “resting” stage, it does not deny its useful function. 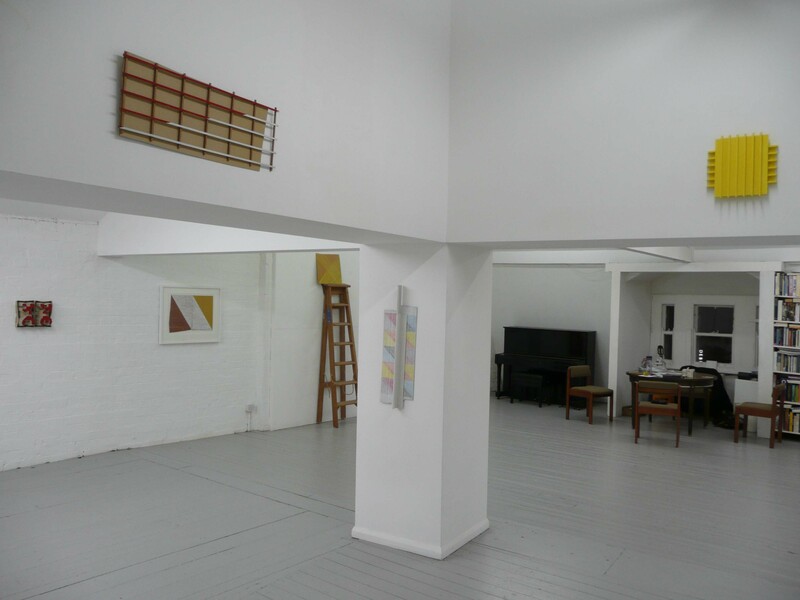 As it leans against the white wall its horizontal steps allude to Donald Judd’s stacks of “specific objects”. 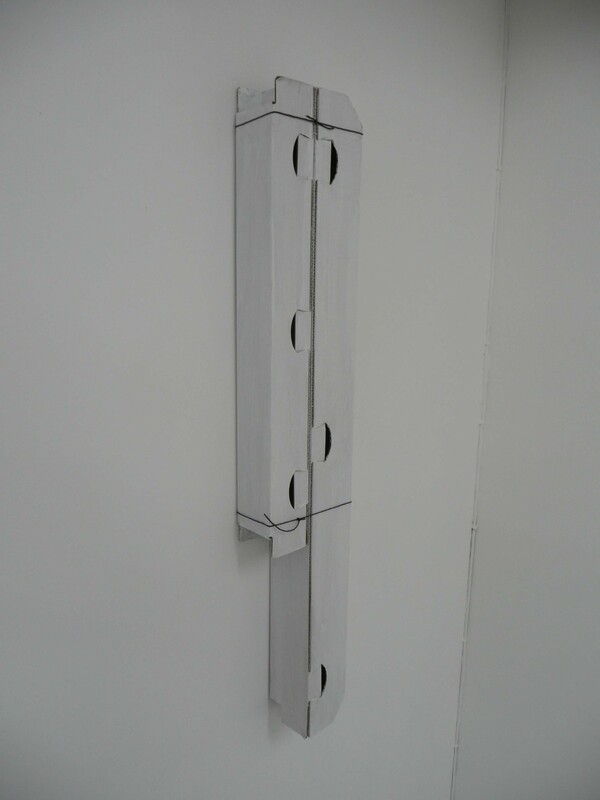 Judd aimed at autonomy and clarity of a constructed object existing in a real space, and a ladder is one example par excellence. 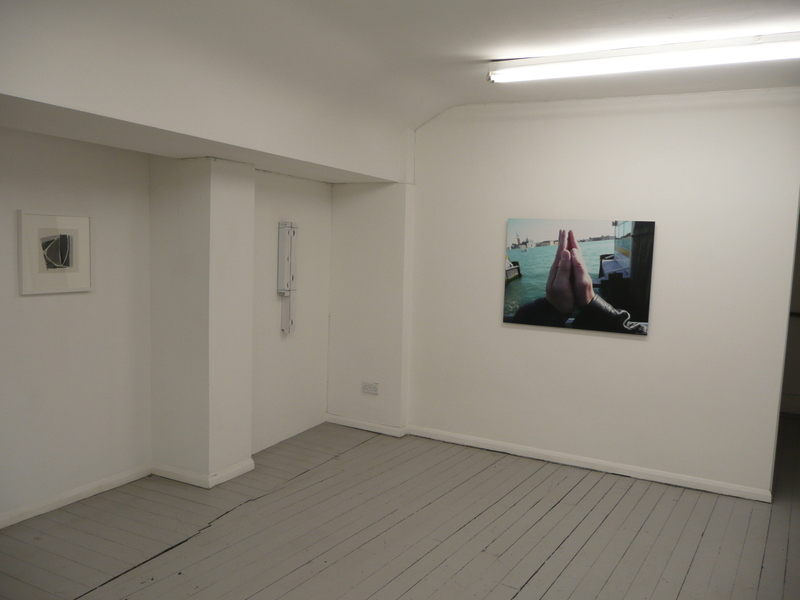 Hill engages the real space too, however, it is akin to a painter’s decision on a composition. 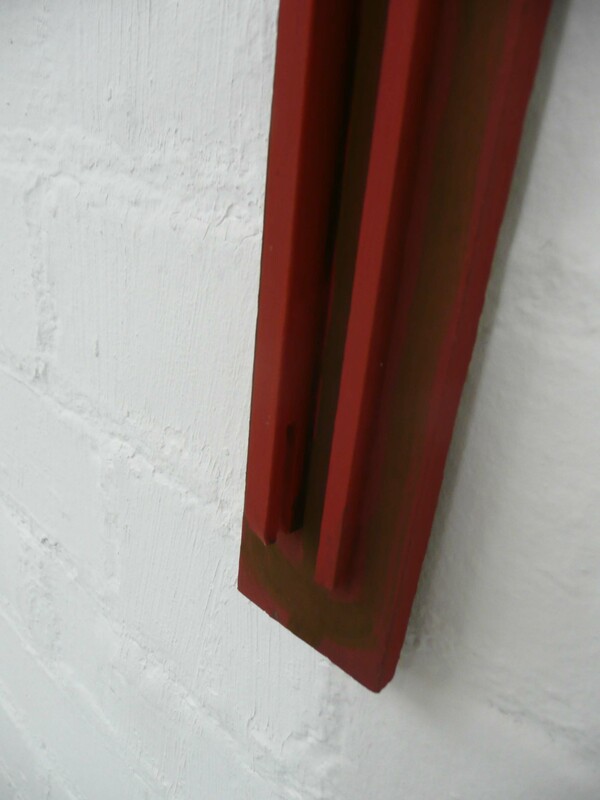 Here the ladder supports the cardboard rectangle in the hues of dry earth. Cut out of the packaging with a Stanley knife the right angles insist on stability, so the eye, if it climbed up the ladder, has to stop there, or move on to the third, smallest, member of this triad. Straight edge on one side, where the saw cut it from the rest of the darkened wood, and curvy linear on the other, it flattens the apex of an equilateral triangle that ascribes the composition. The geometry of spatial relationships does not overwhelm the second layer of meanings, this constellation of time: each form has a past, is now in the present so fleeting that it shifts from a view to a view. 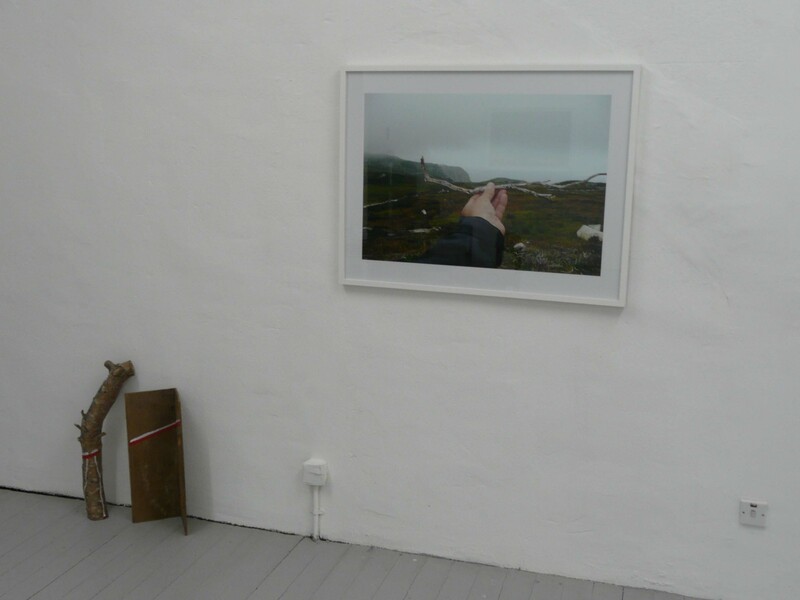 The composition consists from three different constructed objects: a climber, a window and a stick, and so it encapsulates the rest of the exhibition. Any grid may be climbed, four of the exhibits are grids: Twelve, Corner, Red Lines Twentyone, and Red Triangle White Triangle, all 2013. The two bright yellow rectangles of Twelve are as inflexible as a barrier in front of steps. Only when examined closely, the whispered shadows between the horizontals and verticals, gently nibble at the clarity of the construction. Where the ladder broadcasts its utility, the yellow horizontal ribs invite a play, recreational joy from imagined achievement. Yellow hue has that energy and promise. Red Triangle White Triangle allows the light less hues to dampen the mastery of straight lines and angles to define the real space. That decision leads to wonderous allusion to Bergson’s proposition of not achieving the achievable. The red stops in its track, the white takes over as if without energy. Displayed this way up, the red is climbing. Turn it over and …? Most of the exhibits in this part of the gallery were “windows”, Albertian windows. A view of a space illusion, of division between this space and theirs. The photographs, perhaps, contesting the drawings and vice versa. Even if not seen as a contest, a comparison reveals an interesting difference: the drawings are clearly in the space of their own. Framed. Both photographs contain Hill’s hand – which is inside the space of the image and in front of the lens, thus connecting the observer and the observed through continuous space. The sensitive display strengthens the perception of brightness, simplicity and clean fine finish. These values are not accidental. They are central to the historical choices made by the generation of Modernists on both sides of the Atlantic during Hills formative period. I hasten to add that performance was a part of it, perhaps as a result of a short stay in J Beuys’s class. 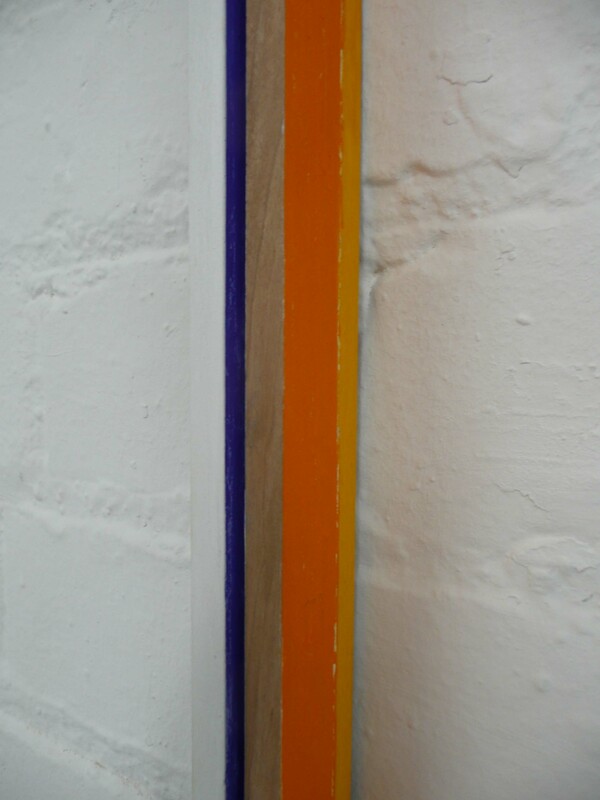 Nevertheless, his art practice has centred on volume and colour. The constructed, non- grid objects have preference for three-dimensional verticality. The verticality intensifies the parallel to the upright standing viewer, sometimes towering over, sometimes softly mirroring the body’s volume, at other times just echoing the narrowest of shadows. 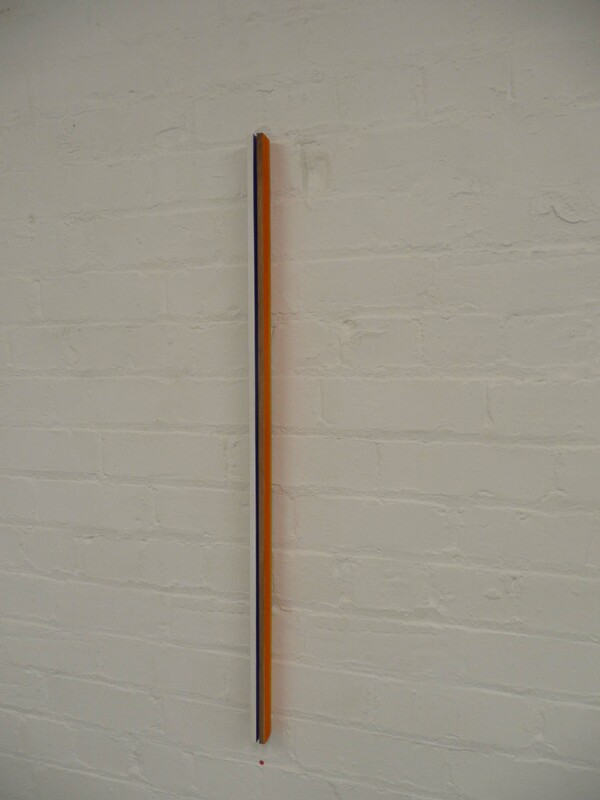 Barnet Newman’ s Voice of Fire, 1967, NG Ottawa, presents his take on verticality and colour with a precision of a machine aesthetics, referred to as hard edge painting at the time. The purity of Mondrian echoes even in this simplest of painterly compositions. 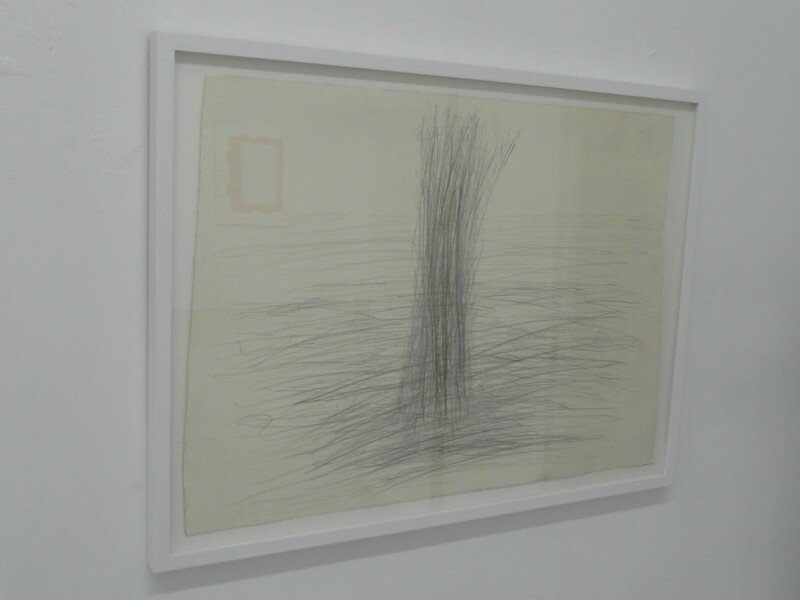 I have enlarged Hill’s stripes out of proportion with Newman’s, to make visible the little shaky imperfections. They are significant as an ode on handling of the material while not killing its soul. There is no obstinacy of the material because the wood is arranged in different sizes, each evoking space and air and continuity with the rest of the real space. ( the co-operation of the whitewashed wall in defining the object as autonomous and in real space is a gift). Hill treats found objects as precious.This packaging is not a dishevelled found rescued object of Arte Povera. Highly developed aesthetic norm holds to its antinorm, as the perfection allows for small imperfect touches. This is significant. First, it connects to non western thought ( I think of the Japanese aesthetics wabi-sabi) and second, it moves away from the machine age aesthetics. Towards pulsating hand, pulse of being in the world. The minimal interference with the past of a found object is a surprisingly successful strategy in Hill’s hands. This aesthetic principle governs most of the “sticks” (the group of vertical constructed objects). I find it so easy to associate this blue object with music and with painterly Orphism of Frantisek Kupka, without any implication of dependency on such sources. It is like a gene replicated in another time and place. 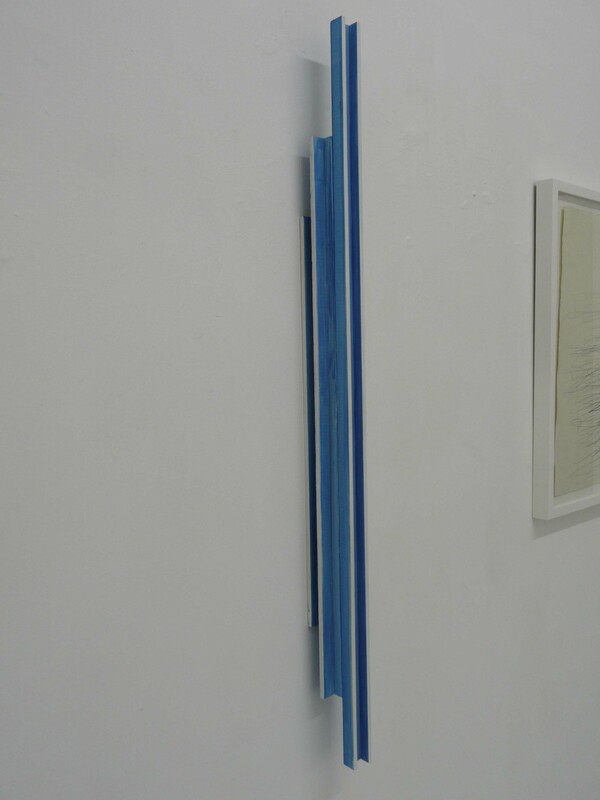 The above photograph is too dark, maybe a detail will reveal that the similarity to Flavin’s forms (light sticks) is an erroneous idea. The spelling of its title is deliberately wrong (for a secret reason and a secret meaning). 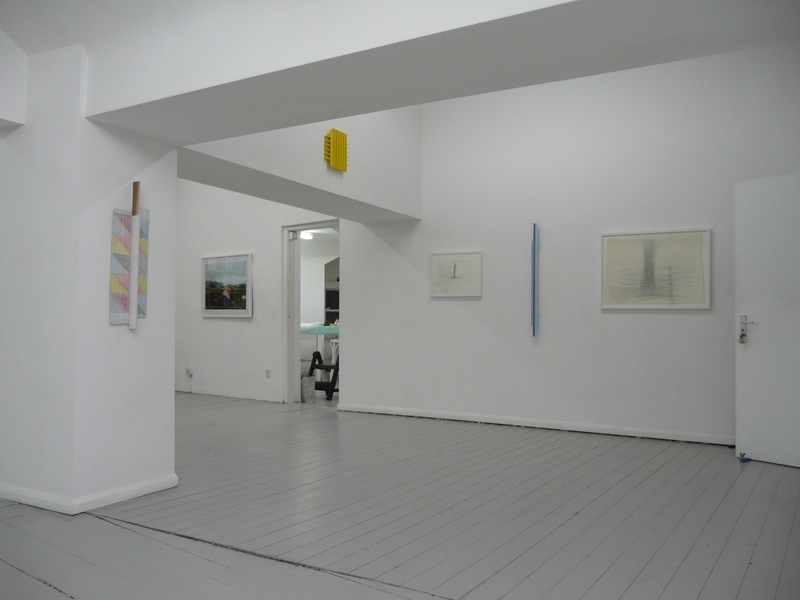 Thankfully, I acknowledge, that ever since 1983 Jamshid Fenderesky built a considerable tradition of solo exhibitions, many as defining as this one. 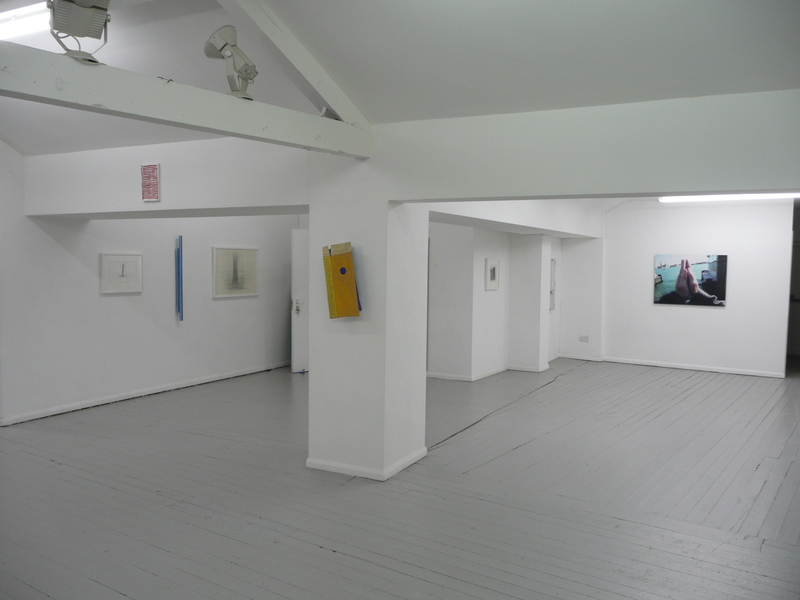 This entry was posted in essay, review and tagged Belfast, Dan Flavin, De Stijl, Donald Judd, Fenderesky, Frank Stella, ladder, minimalism, Orphism, sculpture, Tony Hill. Bookmark the permalink.